The origins of Abbey of Sant'Antimo date back to 352 a.d. where once stood a oratory. In 770, a monastery was constructed at the site. In 1118, construction began on a new monastery over the old one. During the 1870's, the abbey was restored. There is no history of armed forces fighting here during World War 2. This is a complete fictional battle that I have envisioned. Because of this, I have come up with a little background information that is purely fictional. During the early 1900's, the abbey was abandoned for unknown reasons. Since then, the abbey has settled into disarray and is at natures will in til the allies invade Italy and both sides realize what an advantage the abbey holds over the surrounding area. 2. What is the story of the map? The idea is that who ever holds the abbey will have supremacy over the entire area. The abbey is an old, run down monastery that was vacant in til the war came to Tuscany and both sides realized the potential it had for scouting troop movements, calling in artillery, etc. 3. What is the objective of the map? The objective is to hold the abbey in til the enemies tickets run out. 4. How big is the map? The map will be a 16 player size map and will encompass the area around the abbey. 5. How will I make the map memorable? I will make the map memorable by designing a very thought out monastery that will be tough to hold but satisfying when accomplished. I will also make the visuals a top priority that will hopefully leave a lasting impression on the player. 6. Is the map original? The setting for the map is original, Tuscany, but the idea of holding a "church" for a king of the hill game mode is not. 7. What is the time of day and atmosphere of the map? I am thinking either afternoon with a yellow and gold color palette and bright blue sky or early morning dawn with a heavy fog and a golden sunrise. 8. Will exploration be rewarded? Exploration will be rewarded. I will place pick up kits in various places around the map that players will have to find. I will also build other areas that hold vantage points over the abbey, but the ultimate goal will be the abbey itself. 9. How will I direct the player? I will direct the players via roads, dirt paths, and the mini map. There will be plenty of cover for players to make it to the abbey. 10. What is the visual trademark of my map? The visual trademark of my map will be the abbey itself and the rolling, surrounding hills and vineyards. 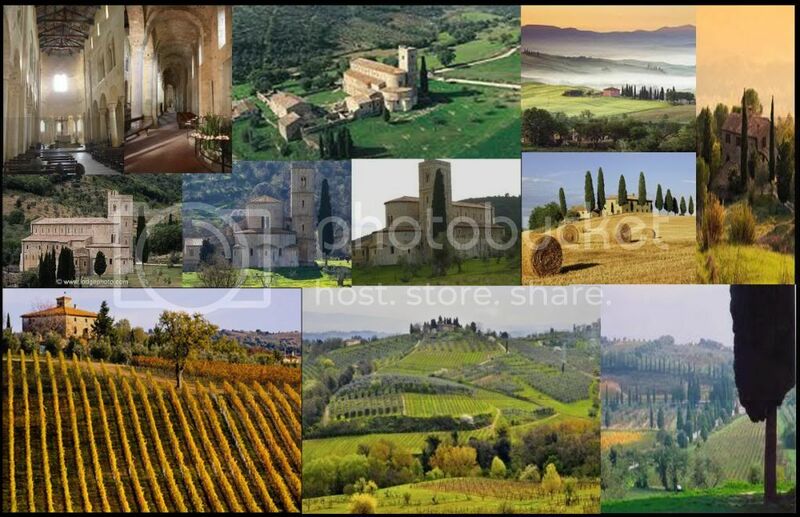 The 6 top left photos are of the Abbey of Sant'Antimo, the 3 top right are some ideas I have for lighting/setting, and the bottom 3 photos are ideas I have for surrounding area. Day 2 Plans: Tomorrow I plan to draw a detailed floor plan of the abbey and surrounding buildings. I also plan to draw the layout for the map including where the spawn points will be, lines of sight, and paths to the abbey.